On Monday 30th July 8 passengers from the cruise ship Crstal Serenity were greeted by GSPCA staff members Tim Pellett and Rual Gomez. The Voluntourists who were on their holidays from around the world arrived at the Shelter just after 9am and had a short induction and were then sent to help the staff and care for the many animals at the GSPCA. Each received a gift of a GSPCA t-shirt to wear for their half day volunteering caring for the many animals at the GSPCA. On Tuesday the GSPCA welcomed the first Voluntourist group of 2018 from the Crystal Symphony. 4 passengers from the ship were greeted by GSPCA staff member Rual Gomez and new staff member Tim Pellett (centre of picture) who has joined the GSPCA as the Community & Training Officer thanks to funding from State Street and Social Security. The Voluntourists who were on their holidays from around the world arrived at the Shelter just after 8.30am and had a short induction and were then sent to help the staff and care for the many animals at the GSPCA. Every year we help hundreds of stray animals find their way home but last month one feathered stray decided he wanted to take a holiday before being reunited with his owners. 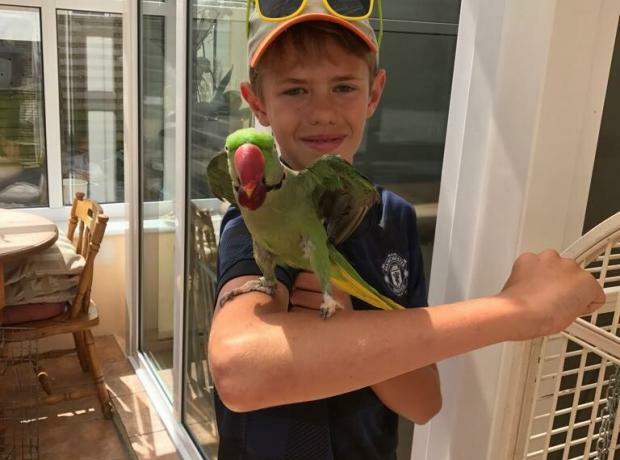 Last month the GSPCA had a call from the harbour about a stray parakeet that had been found on the Crystal Symphony Cruise Ship that had flown on board while they were anchored at Guernsey. Last month the GSPCA welcomed two groups of Voluntourists from the Crystal Symphony. On the 11th August Joni Lamm, Linda Drapeau, Sharon Summerhayer, Geoff Coman, Mary Brown and Gordan Porth were greeted by GSPCA staff member Beckie Smith and on 15th August Sally Vagias, Alan Freeman and Myra Freeman were greeted by GSPCA Manager Steve Byrne. The Voluntourists who were on their holidays from around the world when they arrived at the Shelter had a short induction and were then set to help the staff and care for the many animals at the GSPCA. On Wednesday the GSPCA welcomed 8 Voluntourists from the Crystal Symphony. 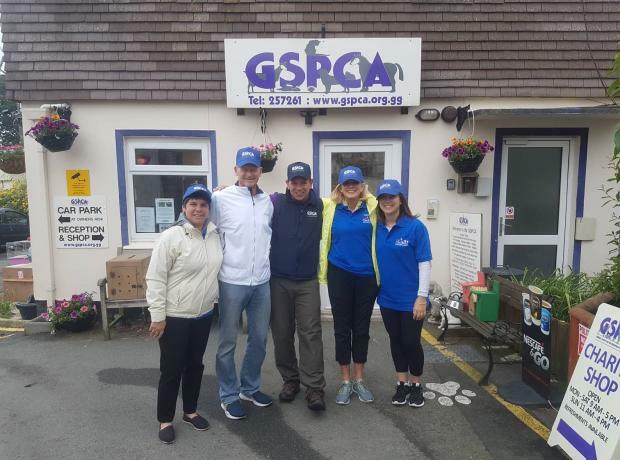 The 7 ladies and one gentleman that helped out were Eleanor Teare, Jessica Madeca, Barb Jones, Eileen Kaminsky, Sara Macefield, Geoff Ford, Dani Ford & Holly Ford all of which greeted on their arrival by GSPCA Manager Steve Byrne just after 9am. 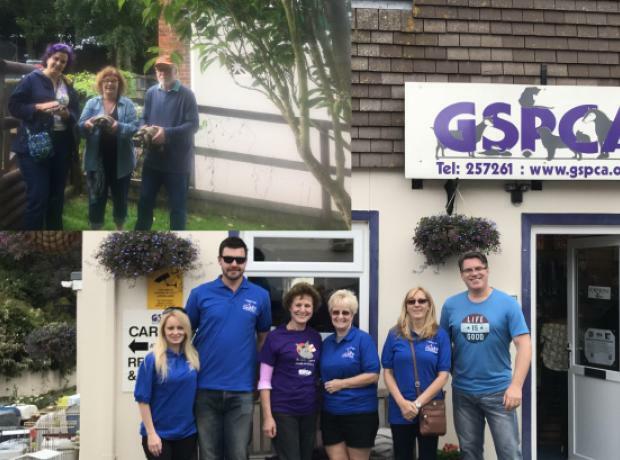 From Canada, the USA and the UK the group had a short induction and were then set to help the staff and care for the many animals at the GSPCA. Today the GSPCA welcomed 6 Voluntourists from the Crystal Symphony. The ladies that helped out were Katherine O’Neil, Shirley Kushner, Lisa Brown, Amber Way, Juliana Way & Susan Carter all of which were from Canada and arrived just after 9am. Steve Byrne GSPCA Manager met the group who after a short induction, a gift of a GSPCA t-shirt and a quick photo with Betty the bull terrier were set to work around the GSPCA. The group helped clean out the birds and sweep out the rabbit pens, cleaned the cats and walked the dogs.